Niagara Falls is a city with a bustling nightlife and offers a variety of amazing destinations and activities to experience with loved ones of all ages. Here are some of the city’s top nighttime spots where you’re sure to have a great time and make unforgettable memories with your family. Located on Clifton Hill and open until 3am on weekends and 1am on weeknights, the Niagara Skywheel takes you on a thrilling ride high above the Horseshoe, American, and Bridal Veil Falls. Sitting at an impressive 175 feet high, the Skywheel features climate controlled gondolas that will take you on a round trip into the sky high above Niagara Falls for incredible views and an unforgettable night in the city. Monday through Friday until August 31st, stop by Queen Victoria Park for the annual Coca Cola Concert Series where live bands perform on a stage in the park, followed by a fireworks show over the Falls at 10pm. Check out upcoming bands and musicians like Eric Ethridge, The Moonlighters, The Rasorbax, and Caribbean Festival Entertainment, and get ready for a ton of family fun and entertainment right next to Niagara Falls. 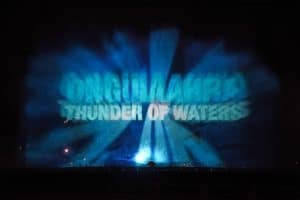 From now until September 4th you can also stop by Queen Victoria Park for the Onguiaahra: Thunder of Waters sound and light show which tells the amazing story of Niagara with incredible water jets, music, and lights. It’s a unique and totally free show that is both informative and thrilling. Every Monday through Friday you can experience a spectacular fireworks show over the Horseshoe Falls where the sky above the waterfalls is lit up in breathtaking lights and colours. And every night you can also take in the beauty of the Falls as they’re illuminated in a colourful array of LED lights. Niagara Falls’s famous Clifton Hill is known as the Street of Fun because it’s lined with amazing one of a kind destinations like the Adventure City arcade, Niagara Brewing Company, Tim Hortons, Movieland Wax Museum, Sweet Jesus Ice Cream, Niagara Skywheel, Dinosaur Adventure Golf, and much more. Take a walk down Clifton Hill at night and experience first hand what makes this street the most exciting place in the city.